Fr. Victor Potapov: Fr. Gregoire, please tell us about your mission. Fr.Gregoire Legoute: Today we have five parishes and two chapels, but only two priests. It is very difficult to visit our parishioners, to pay rent for the buildings we use for church services. We need help in acquiring land to build a church. There is no social support system in Haiti, so all social work is done by the Church. We need to have schools and hospitals in the vicinity and affiliated with every parish. Currently we have a center for mentally and physically handicapped children, and we do our best to make it grow. There are 100 children from three to 20 years old. Our church schools not only provide education, they also teach the basics of Orthodoxy. Students pray every day, and teachers of Catechism are always available to teach and guide. We have twelve readers who wish to receive a theological education to become deacons and priests to help us in the near future. They do reader’s services (obednitsy), and priests travel to parishes twice a month. Fr Jean travels to the parishes in the North and I go to the south. Of course there are also marriages, baptisms and funerals that happen on weekdays. Since we do not own cars, we have to use public transportation and this presents certain difficulties. We are hoping our Orthodox brethren will help us in propagating our Holy Faith in Haiti. Fr. VP: Fr. Gregoire, what attracted you to Russian Orthodoxy? Fr.JL: One day Fr. Avraami invited me to participate in an evening of prayer at someone’s house. What I saw and heard when I came has changed my life. I did not know if I was on earth or in heaven. I became Orthodox then and there. Fr. VP: How many Orthodox were there in Haiti at the time? Fr.JL: Around fifty. The relatively well off Orthodox in Haiti live in urban centers, but we are too far into the island for them to attend services and help us. In the ROCOR community there are around 2,000 Orthodox. Fr. 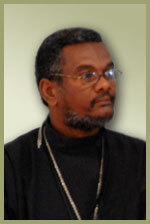 VP: Priest Gregory Williams did a lot for the Haiti mission. Yet when he left the Church and joined the schismatics you did not follow. Why? Fr.JL: Shortly before the Reunification in 2007 Fr. Gregory told us that he is renouncing his administrative duties, and recommended that we hand over all of our church property to the Synod of Bishops. However, in June 2007 he said that he will commemorate and answer to bishop Galangal. It was right before vigil. We expressed our disagreement and left, and Fr. Gregory served alone. Soon I found out that at a meeting at the St. John of Shanghai and San Francisco parish in Okai Fr. Gregory said that those who follow him will receive material benefits, and those who will not, will not receive anything. We were insulted by these talks of material benefits and preferred to follow our faith and our Church leaders. Around Easter I received a letter from Archbishop Hilarion, with an appeal to remain in ROCOR. Bishop Michael also sent us an appeal to remain within ROCOR. We knew we had support and that we needed to follow our bishops. Fr. VP: What are you in most need of? What can we help you with most? Fr.JL: We lack everything in Haiti. We don’t have liturgical books, vessels, land to build a church, money for our schools. Fr. VP: You were a delegate at the latest general assembly of the Eastern American Diocese which includes Haiti. How did you feel being among Russian and American clergy? Fr.JL: I was happy to be among my brothers. I knew many of them already. I haven’t been able to attend these conferences before because of visa complications. But this time I came especially to appeal for help to our mission in Haiti. I am very happy that all, starting from Metropolitan Hilarion showed so much attention to Haiti, to me and Fr. Jean, and our parishioners. Fr. VP: Would it be possible for you to accept pilgrims from USA and Europe? Fr.JL: There are many foreigners in Haiti, and that wouldn’t be a problem. Our churches are listed in the Synodal parish list. Pilgrims can come and take part in our lives. Everyone is welcome. Fr. VP: I hope the time will come in a the very near future when we will serve together in a church in the capital of Haiti built with the aid of Orthodox people from all over the world. Fr.JL: We are counting on your support and prayers.